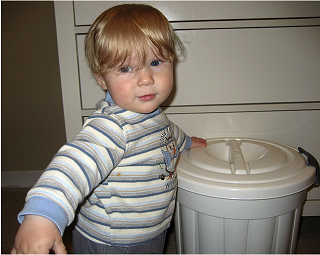 I have two pails - a dry diaper pail for cloth diapers -- I don't put them in a solution - I soak them overnight in Bio Kleen Oxygen Bleach in the washer. I can't remember who told me about it - but it really works -- I put in a Bounce dryer sheet - I cut them in half and put one in each pail. They just end up being washed if they are in cloth pail - I suppose if I was a fanatic I could use it as poop catcher in a diaper... or thrown out if in trash pail. This was one tip I found truly worked!! Thanks to Lisa for this great Frugal Baby Tip!